The internet has become the platform of choice to share opinions and views about almost anything and review sites are now an important element of the e-commerce space. A vast majority of online buyers (almost 90%) base their purchase decisions after reading online reviews and are greatly influenced by them. For most of these online buyers, online reviews are as credible as personal recommendations as they provide detailed information about a specific product or service. Online reviews have become an essential part of online buying, while small and medium businesses have also started realizing their importance. Popularity of online reviews means there is money to be made there and that’s why businesses of all kinds are now focusing more than ever on developing their own review and recommendation sites. Most online users head straight to review sites while searching for a product/service such as a movie, books, gadgets and even yoga classes. The reviews and customer feedback on such review sites play a very important role in shaping customer perceptions and have the power of influencing their buying behavior. Importance of creating reviews for unique niche products is even higher as the competition is relatively low and customers often find it hard to collect information about such unique products. Most people think that online reviews work only for big businesses like Amazon and Yelp! and there is nothing much in them for small businesses and individuals. However, anyone can display reviews on their site, whether big or small, and can benefit from the rating system. 1 What’s in Review Plugins for Bloggers and Small Businesses? 2 Why use a WP Review Plugin? What’s in Review Plugins for Bloggers and Small Businesses? Every blogger has a product or two in their list that they really like and want to share their experiences with the world. Their reviews not only help others make more informed decisions, but also have the potential to generate money through ads and affiliations. Genuine, unbiased and authentic reviews are always in demand and can be rewarding in the long-run. Online reviews are especially beneficial for small businesses that can display those reviews on their own websites. It may not be practically possible for potential buyers to read all the reviews scattered across many sites. But a small-medium business that puts most of these reviews at one place makes it easier for readers to find them. On the other hand, failing to display reviews on your own site could potentially mean losing an important component of the sales funnel. Why use a WP Review Plugin? Online reviews have the power to influence buyer’s decisions and adding a review for a particular product or service to a website allows site owners to incentivize a purchase. Online reviews also help generate user content and WP review plugins make it easier for everyone to upload and update content. WP review plugins add functionality to a website and encourage user feedback on products, services, content and more. Review summaries also help deal with the short attention span of online buyers who only have time to skim-read web pages. These plugins help present information in such a way that readers can quickly have a look at important points and continue reading if they find the product/service interesting enough. Most people would simply move on to another site if they are unable to find anything that catches their eye. Review plugins help users grab reader’s attention by presenting information in a better way. Bit-sized versions of full review posts make it easier for readers to digest information and help outline gist of a review. Most review plugins allow creating review summaries that help grab attention and prompt visitors to read further. Having genuine and useful content is not enough in today’s competitive e-commerce space and we also need a system that ensures proper presentation of information. 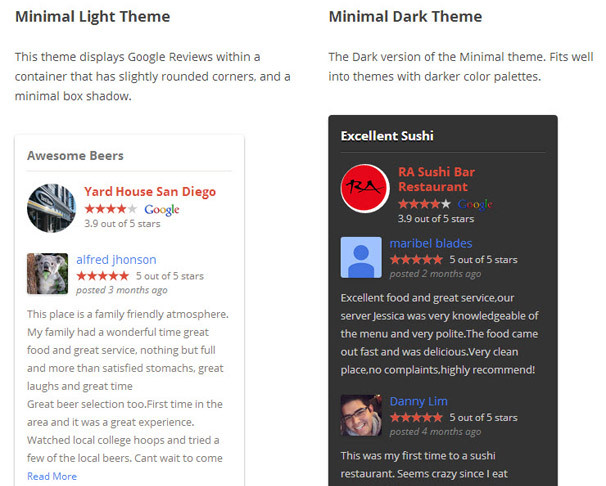 Review plugins allow creating beautiful-looking reviews and rating systems with very little effort. They also help automate processes which can quickly become hard to manage if done manually. The tricky part is to find the WordPress review and rating plugin that fits your budget and offers all the functionalities you need to be more productive. To make the selection process easier, we have filtered out some of the best WordPress review plugins that offer great functionality and allow users to start creating eye-catching reviews right away. WP Product Review is a review plugin created by ThemeIsle, we use it here on AlienWP for our hosting reviews section. It adds a section at the bottom of your posts where you can mark the product being reviewed in different criteria and will give an aggregate score. You can also add pros and cons for each item which will be displayed in a neat table along with the product image. You can also customize the table, create comparison tables and import Amazon product information. Available at MyThemeShop, WP Review Pro is a powerful WP review plugin that is optimized for speed, responsive, SEO ready and can be used on unlimited sites. It’s available as an instant download and very easy to install, thanks to one-click installation. 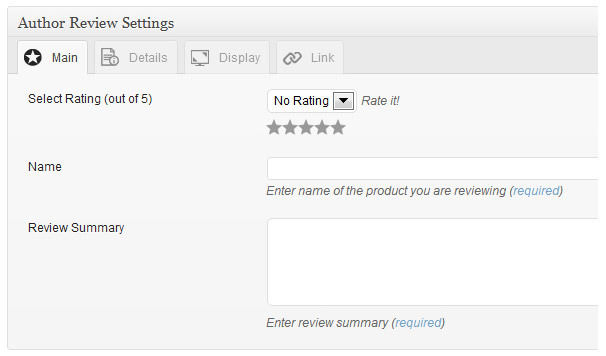 Users can place review boxes featuring description, name, rating etc. at the top or bottom of posts. The plugin comes with valid schema code and ratings appear along with the title and Meta description in Google searches. The plugin offers two rating systems i.e. 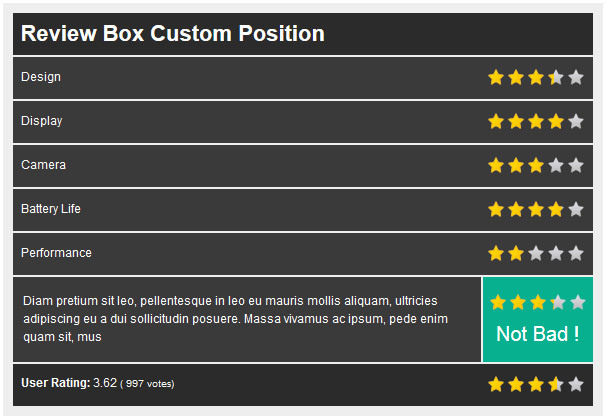 percentage and points and supports customization of most elements, including title, review box, border and more. It automatically shows the ratings on thumbnails and also works with most free and premium WP responsive themes. 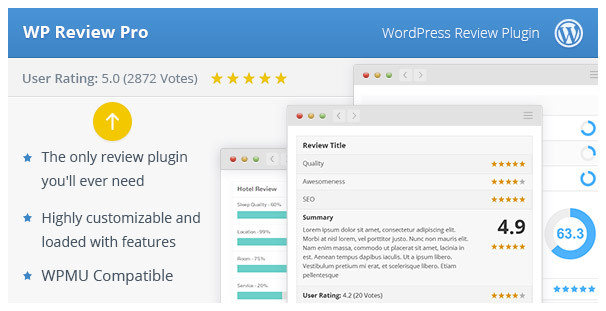 Its mobile friendly design, support for shortcodes and other features make the plugin one of the most feature-rich WordPress review and rating plugins. The plugin allows every visitor to leave a vote (configurable) and automatically calculates the average vote. It’s also very easy to setup and use and allows beginners to get started in no time. Users can set default options if they post about products with similar features such as smartphones or laptops. This saves them from repeating the process for every single product and boosts productivity. 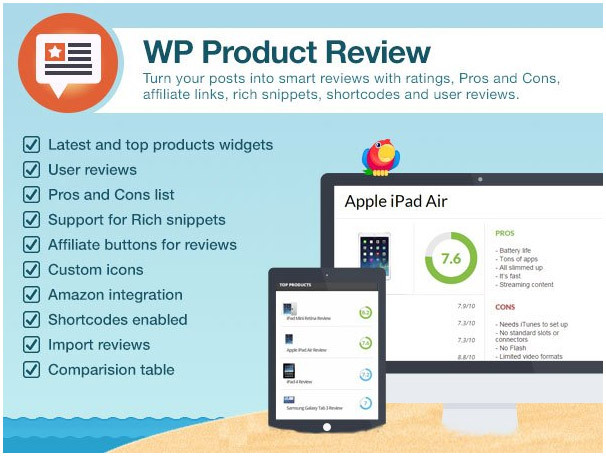 WP Review Pro is available for $77 and comes with a 30-day money-back guarantee and one year free support and upgrades. WP Rich Snippets is an easy to use plugin for adding editorial or user reviews to your WordPress website. It makes use of Schema Structured Markup so your reviews will appear in the Google search results with stars next to them reflecting your rating for the review, this is good as it helps your page stand out more in the results. The plugin is easy to setup and get started adding review data to your blog posts or pages, there are a number of paid add-ons available which will allow you to add even more functionality. As the name suggests, Author hReview is an author-only plugin and does not allow visitors to leave a review. This means that the overall ratings only reflect the opinions of authors. The plugin offers only one way of rating products i.e. stars (based on schema.org), but there are plenty of options users can configure. The plugin is fairly easy to use and provides visitors the most important details they might want to see in product reviews. The plugin works with most WP themes and the publisher offers help in case a user faces trouble. Being an open source software, Author hReview is backed by a community of developers and contributors, while documentation is also available for reference. Author hReview Lite is available for free and is suitable for users who want a simple solution and basic functionality. A single-site license (onetime payment) costs $69, includes one year of updates and support and provides access to all plugins. The one time Multi Site License costs $139, can be used with all sites and includes one year of updates and support and access to all plugins. The Unlimited plan is available for $199, includes all the features plus access to all add-ons in addition to plugins. The ultimate deal ($299) offers lifetime support and updates and access to all plugins and add-ons. The main package includes Author hReview as well as WP Reviews. Taqyeem is one of the most affordable WP review plugins that features a sleek design and dark/light themes. 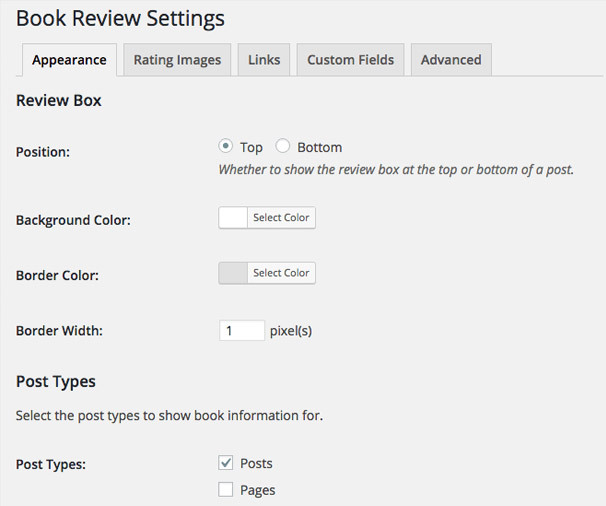 The plugin supports unlimited colors, review criteria as well as custom post types (in addition to posts and pages). The plugin suits users who prioritize aesthetics and want a lot of customization options. More than 500 Google Web Fonts are supported and users can easily change element fonts from theme settings. The rating and reviewing plugin allows adding beautiful-looking reviews and ratings and using a bunch of customization options, including changing fonts, colors, images, criteria and style. Taqyeem is available from different plugin stores for around $20, but the official site offers its plugin for just $17. 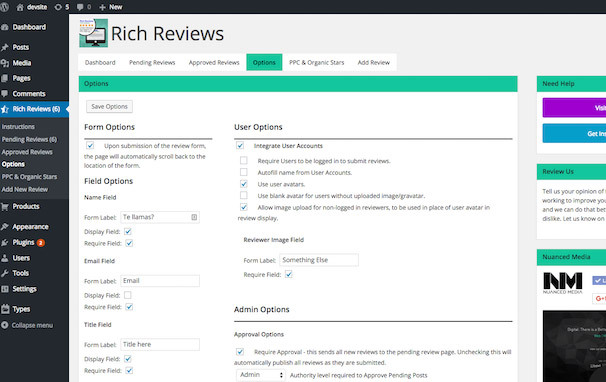 Rich Reviews is an open source software for users who use shortcodes a lot and the plugin allows them to just copy the shortcode into a page or post ( after going through the default settings). The plugin offers three different types of shortcodes i.e. show, form and snippet. Users can even copy all of these shortcodes to show reviews by specific users, add forms through which visitors can leave their ratings and comments and show the overall rating. Each shortcode comes with its own expanded version, allowing users to add a specified number of ratings or reviews. Authors can add their own reviews easily and display them along with user reviews. The rich snippet plugin provides users with complete control over the review system and allows them to use three different types of reviews i.e. per-post or per-page, by category and global reviews. Moderated submissions allow users to select the reviews that can be added to a site. Shortcode functionality makes it easier to include key features on any post, page, footer, sidebar or widget. Being lightweight and minimalistic, the plugin does not affect performance and follows Google Rich Snippets protocol. The plugin is initially available as a 30-day free trial after which users have to pay to continue using it. Available in 15 languages, Book Review is a specialized plugin for sites that mostly do book reviews and saves users a lot of time. Reviewers just need to provide ISBN number and the plugin automatically populates fields including author name, title of the book, cover photo and more. The custom links feature allows users to enter affiliate URLs and automatically adds links to all reviews. Custom fields allow users to review other categories such as music, movies and TV shows. The plugin is easy to setup and use and allows customizing many review elements like background, border and so on. The plugin covers almost all aspects of creating book reviews and is recommended for users who want an easy-to-use and efficient book review plugin. The open source software is available for free and is ideal for beginners who are looking for a simple plugin that gets the job done without any hassle. Google Places Reviews Pro is among the top Google Reviews plugin for WP and allows users to display Google reviews using shortcode (post and page content) and a customizable widget. The SEO optimized plugin comes with built-in caching, widget themes and display options that help users match almost any web design. Users can display up to five reviews, link to Google+ page, their avatar and overall business rating and business information. The review filter allows users to hide negative reviews and ratings for a better exposure and brand image. A variety of widget themes are also part of the package and allow looking up local businesses through the widget interface. The plugin collapses and expands long reviews as they often result in a very long widget, which hurts readability and design. The basic version of the plugin is available for free and supports many pro features except shortcodes, filtered ratings and custom avatars. Pricing for the Pro version starts from $45 (single-site license), while 5-sites license costs $87 and license for up to 15 sites is available for $150. Thank you dude for the Amazing Review Plugins. I think WP Product Review Lite is the best Review plugin for WordPress that every blogger should be using… I’m using it myself and it helps me even get my blog posts ranked higher! BTW, Thanks a lot for the list. Your blog is incredible. I am actually delighted to read this post that carries countless of helpful information. This blog is very useful to understand the Word Press concept also. Thanks for sharing with us. This is a testimonials carousel that you can add to your sidebar or other widget area on your website and show your users reviews from your customers. It also includes schema markup so you can get stars in search results under your URL’s. Hey team, Thanks for listing the review plugins. It’s very useful to find it all in one place as I was checking for the best one to use in my blog. I am about to use WP Product Review Plugin. It’s really user-friendly.